It was good to be at the HTB Leadership Conference on Monday and Tuesday. They filled the Albert Hall, and still managed to sell a few hundred extra tickets for the overflow venue at Holy Trinity Brompton Road. There were some very powerful talks and interviews; an incredible array of seminar topics; lots of prayer and discussion and networking; and some fantastic music from the Worship Central team. And there was, interestingly, a very strong Catholic presence: Cardinal Schönborn, for example, was one of the keynote speakers; Christopher West led a series of workshops over two whole afternoons about the Theology of the Body; and the Carmelite Church in Kensington was packed for the celebration of Holy Mass (followed by breakfast for all present), as part of the conference programme, on the Tuesday morning. I won’t even attempt to summarise the content of the talks. The phrase that struck me most was from Bill Hybels, Senior Pastor of Willow Creek Community Church in the States. It was a throwaway line in the middle of a very practical talk about creating a vision within your core team. Here is the line: “You know, we sometimes forget this: that it’s natural for churches to grow!” In other words, if a Christian community simply lives its faith to the full; if Christians simply become the disciples they are called to be; if we simply believe and pray and love and hope and serve as we are meant to: then of course our churches will grow. What should baffle us is not why they sometimes do, but why they usually don’t. As St Catherine of Sienna said: ‘If you become who you are meant to be, you will set the world on fire’. There was an intensity about the conference, a passion for souls, a Christian fervour, that you don’t often experience on an average Sunday morning. I was wondering to myself if this intensity was something attractive only to those ‘professional’ Christians (like myself) who sign up for conferences like this, and whether it might alienate ordinary Christians. But the conference started on Monday, 13 May, and I started to connect it with the Feast of Our Lady of Fatima. In the morning, I had celebrated Mass in the local parish in Chelsea and given a short sermon. I spoke about Our Lady of Fatima’s passion for souls, the sense of urgency which she communicated to the three shepherd children, the seriousness of her message, and the unconditional commitment to the gospel message of salvation that she expected from the children and from every Christian. Then I walked up the road to the HTB Leadership Conference. When you see things from the perspective of the call to conversion and the invitation to salvation, there is not a great distance from Fatima to Holy Trinity Brompton. From celibacy (my last post) to dating. I hear a lot, in pastoral conversations, about how difficult it can be for single people to meet others; or, having met them, how hard it is to take the relationship to a deeper and more committed level. But the extra difficulty today, it seems, is that many people don’t even know what they are looking for in a relationship; and if they do, they are psychologically hard-wired – because of mobile phones and social media – to undermine the very relationship they want. Rebecca Holman moves from examining her own relationships to some more general points about why dating is so difficult today. I have called myself single for the past decade. Strange then, I realised recently, that I have rarely been properly on my own. I haven’t lived with a boyfriend, introduced anyone to my parents, or been on a mini-break. Yet even without an official ‘boyfriend’ there are normally several text conversations with potential beaus buzzing away on my phone. I also tend to have a few guys on a low-level stalk on Facebook, and there’s always that frisson of excitement when an attractive man retweets one of my ‘LOLz-ier’ status updates. I might be missing out on love, but I’m never short of intrigue, and right now intrigue seems more fun. Some of this intrigue even becomes actual, real-life, human interaction and perhaps… more. But mostly I’ve found myself in a perpetual state of limbo – stuck somewhere between first encounter, a hook-up and a full-blown relationship. It’s thanks in part to social media. Twitter, Facebook and Google have turned the dating world upside-down, changing how we meet people, what we know about them before we do – and introducing a new layer of ambiguity into single life that generations before us never had to contend with. I am not in a relationship – or in what someone 20 years older than me would consider a relationship – yet rarely am I definitively single. There is not quite a word for what I am. Our vocabulary is straining as much as we are to encompass the world of modern dating. If, like me, you’re a ‘millennial’ (born between 1983 and 2000) you will have never known adulthood – or adult relationships – without a mobile phone. Like me, you are probably so used to keeping your options open – and not deciding what you’re doing on a Friday night until about 6.59pm that evening – that the idea of ‘dating’ seems pretty foreign. Actually phone someone up to ask them out and agree on a date at some point in the future and put it in my diary? Unthinkable. What if I get a better offer? Instead, millennials like to keep it vague. Instead of dating (an American term anyway) we might be ‘seeing someone’, ‘having a thing’, ‘hooking up’. Increasingly, we ‘hang out’ – and not necessarily as a twosome. Ours is a generation of contradictions. We bravely (recklessly?) let the rest of the world into our online world with gay abandon: you’d like to see 50 pictures of me on a bikini on the beach? Go ahead! Want to know how I’m feeling at this exact moment? Here you are! But in the world of endless options, where nothing seems permanent, and you never have to interact with anyone face to face if you don’t want to, me actually picking up the phone, telling someone how I feel about them, or even asking them out for dinner seems like too big a risk. Why make a phone-call or suggest a date when you can send a non-committal text that merely dangles the possibility of meeting? If they’re keen, you’ll see each other; if not, they’ll plead prior plans. No one’s feelings get hurt. ‘Face-to-face contact is much richer. We have more visual and audio cues to help us form an impression of someone.’ Of course endless texting will never offer the same insight into someone’s personality as even a single face-to-face conversation. The I-don’t-know-what-is-going-on phase of a proto-relationship can continue far longer now. You can become vastly experienced in the heady yet confusing dance of Early Days – I have had years of it, and know all the steps – yet remain an ignoramus about the mysterious state of proper Girlfriend and Boyfriend. You can read the whole article here – which has some extra paragraphs about how technology can actually help a relationship as well as hinder it. Most of us here today are guests of the community. I just want to say to Sister Mary Benedicta and to all the community how happy we are to be here with you, and how grateful we are for the chance to witness this profound step you are taking. We know what an incredible journey this has been for you – to arrive at this day of your First Profession. A geographical journey, from Nigeria to London, and from London to the New Forest, with one or two detours in between. A journey of faith, coming to know the Lord better, drawing closer to him. And above all it has been a journey of vocation, trying to listen to God’s call – his personal call to you, speaking to your heart, and speaking through so many people and events. Abraham only had to travel a few hundred miles when he heard the call of the Lord, from Haran to the Holy Land. You have travelled many thousands of miles. But then he was travelling on a camel, not a 747; so we should give him some credit [Genesis 12]. A vocation to religious life is a mysterious thing. It’s full of paradoxes, of apparent contradictions. The Scripture readings of the Mass help us to understand them in the right way. On the one hand, a religious vocation is always an unexpected call. It comes as a surprise. It startles and even shocks us. It’s not something we plan. This is why, in Mediaeval and Renaissance paintings, Mary is always doing something when the Angel comes: praying, reading, sewing, etc. One of my favourite modern images of the Annunciation depicts Mary hanging out the washing on a blustery afternoon, and the angel almost swoops down between the sheets – to her utter astonishment. So a vocation is an unexpected call. On the other hand, a religious vocation is a dream that lies hidden within the heart, because God always calls us to be the person that we long to be, the person we are made to be – even if we don’t quite realise or acknowledge it at the time. It’s his heart speaking to our heart. This was the phrase of St Francis de Sales, which as we know became the motto of Blessed John Henry Newman: Heart speaks unto heart. So you are listening to the call of God, and at the same time listening to its echo in your own heart: Who am I? What does God want of me? What do I really seek for myself? Ultimately, they will come together, if we keep listening and keep following. Another paradox is to do with relationships. On the one hand, we seem to lose so much, to be going further and further away from those we love. This was part of Abraham’s experience, put so starkly in the command that God gave him: ‘Go from your country and your kindred and your father’s house to the land that I will show you’ [Genesis 12:1]. And this is part of Sister Benedicta’s experience. To leave one’s family, one’s home, one’s country; to leave one’s work, one’s parish, one’s set of friends and companions. It’s hard. But in the Letter to the Romans today, St Paul explains something very important about the spiritual journey. That the closer we come to Christ, the closer we come to others – even if we are separated by a great distance. And the more faithfully we live our own personal vocation, the more connected we will be in Christ’s body, which is the Church. ‘For as in one body we have many members, and not all the members have the same function, so we, who are many, are one body in Christ, and individually we are members one of another. We have gifts that differ according to the grace given to us: prophecy, in proportion to faith; ministry, in ministering; the teacher, in teaching; the exhorter, in exhortation; the giver, in generosity; the leader, in diligence; the compassionate, in cheerfulness’ [Romans 12:4-8]. We have different gifts, different vocations; but we are all united in the one body. Of course, at the emotional level, we miss people; we wish we could be with them, talking, touching. But at the deepest level of faith, of charity, never forget how close you are to those you love. There is no separation in Christ; and in a mysterious way, your vocation brings you closer to your family and friends, because you are rooted more firmly in the love that binds you together. A final paradox is about obedience. You are certainly making a lot of promises today! I’ve read the Profession. You promise obedience to God, to Blessed Mary, to Blessed Dominic, to the Prioress, to her successors, to the Master of the Order of Preachers, according to the Rule of Blessed Augustine and the Constitutions of your Congregation. Lots of obeying! Plenty of people to listen to! You seem to be losing so much freedom. But this isn’t really true. First, you are making this profession freely, you are embracing this life freely; just as Mary said Yes to the angel with absolute freedom. 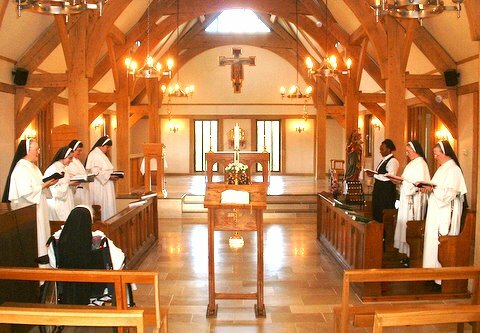 And secondly, you are making this profession in order to have a deeper experience of the freedom that comes through religious life, and specifically through the life of the Dominican Sisters of St Joseph. You believe that there is something important for you here: the prayer, the love and example of your sisters, the apostolate, the way of St Dominic and St Catherine. You have discovered an inner freedom here, and you want to enter into it more fully. It’s not a lifelong commitment, but it is nevertheless, for this important period in your life, a wholehearted commitment; so that you can experience with your whole heart, without reservation, the life of this community and this vocation. When he called Abraham, God promised to bless him and to bless others through him. He makes that same promise to you today.